Dimitrios offers a discount of 50% on their first / introductory lesson! I am a professional guitarist based in Leeds and I specialize in Jazz guitar. I started playing the guitar when i was 13 years old and moved to the UK for my studies. I am a graduate of Leeds College of Music and I perform in several venues around Leeds, the UK and also Greece with various projects including my own. During the course of my career I have taught many different levels and ages from complete beginners to advanced players. 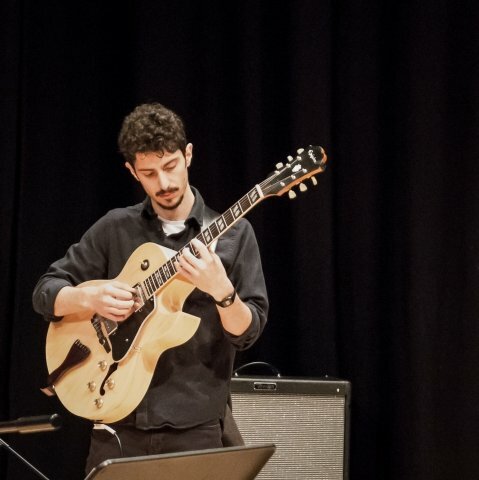 Also, as a student myself, I have been taught by many excellent teachers in Athens, In the UK and also by artists that I admire, like guitar virtuoso Peter Bernstein. From that I have acquired a big range of academic material like hand-outs, scores and transcriptions that I will use in my lessons. As every person learns differently, my approach always depends on them and what they want to get from the music. But with that said, I always like to have a structured approach in my lessons. Repertoire: Blues, Rock, Country, Jazz.